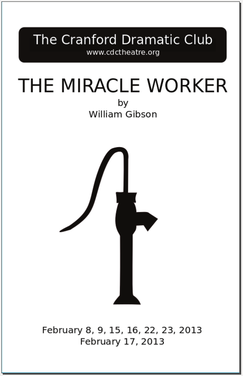 THE MIRACLE WORKER is produced by special arrangement with Samuel French, Inc. New York City. Immortalized on-stage and screen by Anne Bancroft and Patty Duke, this classic tells the story of Annie Sullivan and her student, blind and deaf Helen Keller. The Miracle Worker dramatizes the volatile relationship between the lonely teacher and her charge. Trapped in a secret, silent world, unable to communicate, Helen is violent, spoiled, and almost sub-human and treated by her family as such. Only Annie realizes that there is a mind and spirit waiting to be rescued from the dark, tortured silence. With scenes of intense physical and emotional dynamism, Annie's success with Helen finally comes with the utterance of a single, glorious word. * - The February 8 performance was cancelled due to snow storm (Nemo). * - The February 22 and February 23 performances will be sign language interpreted for the deaf and hard of hearing.